Perplexus is a can’t-put-it-down, three dimensional ball of fun. With plenty of twists, turns and barriers between start and finish, it will leave you perplexed. Watch out though because once you try it, you’ll be hooked! It is a 3-D labyrinth game enclosed in a transparent plastic sphere. By twisting and turning the sphere, players attempt to maneuver a small, steel ball through an intricate maze composed of narrow plastic tracks. You begin at one of three starting points, and try to roll the ball up, over, under and around all the way to the end. There are many obstacles and 100 barriers of varying difficulty that must be navigated in order to reach the finish. The experience offers hours of entertainment and is equally enjoyed by children and adults alike. You must work with and against gravity as you maneuver up walls, around corners, through loops and more. The whole sphere is used so that one minute you are "right side up" and the next second, the ball rolls around to become "upside down" on a completely different track! Various numbered "save points" along the way can be used to start over where you left off once the marble falls off the track. Race against the clock or challenge friends to master this maze and become a pro. Perplexus is fun and educational at the same time. Children will have hours of fun as they improve hand-eye coordination, fine motor skills and spatial relationships. A few of the other skills involved in playing with this truly unique spherical maze are patience, determination and dexterity. Perplexus is 100% kid powered, so no batteries or electricity are required. But that doesn't diminish the fun, it actually adds to it. You will be amazed at how excited and hooked people get when playing this game. Working with gravity, players must carefully shift, flip and twist the sphere to guide the ball through the various tracks. 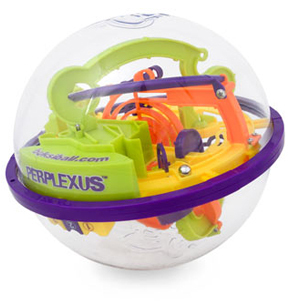 With 3 levels to solve, Perplexus will have you busy turning, rotating, angling, and balancing. Just about anything to get that metal ball down the correct track. This toy is nothing like old school maze games of the past, and its small size makes it easily portable. Take it in the car on road trips, or allow your children to take it along to a friends house. No set-up, clean-up or batteries. Ages 6 & up. Order Yours Today! Perplexus - An extremely unique labyrinth game. This additively fun three dimensional maze helps to improve hand-eye coordination and spatial relationships. Tons of fun for all ages. Order Yours Today! Pretty much the best toy ever. Be the first to get six in a row and win! A two-sided board for use with 2-4 players.